Vacationing in Florida is as American as apple pie. The ocean provides a clean feel to the state, and the miles of beach offer the perfect getaway for thousands of vacationers every year. It’s organic to rejuvenate near ocean water, and many people come away from a vacation here feeling more prepared to take on the daily grind. However, finding vacation lodging might become challenging, because there are so many vacationers in the area. Finding Bradenton hotels is often part of that challenge, which is why people choose one of greater Sarasota’s keys to get away from it all, especially Siesta Key. Siesta Key is a beautiful area for resort rooms. This area, one of three main keys near Bradenton, is the most popular, due to its natural beauty. It provides the softest sand for vacationers, picturesque scenery, a range of accommodations, and a number of interesting sights. The public beaches are serene and clean with full facilities, and the town offers a number of unique eateries, beautiful homes, and activities for every member of the family. Vacation lodging in Siesta Key is as convenient to Bradenton as an actual Bradenton hotel. It’s easy to travel around Florida from Siesta Key; simply take a taxi, use the clean, convenient bus system, or rent a car to move you north to Bradenton. Cross the bridge to the mainland from Siesta Key, pass through Sarasota, and continue north until you reach Bradenton. If you’d like an ocean view on your trip, opt for Route 41 straight up the coast, and treat yourself to a more scenic drive. Rated #1 Beach in the U.S. Relaxing in a resort room in Siesta Key is a reward in itself. The town has won a number of awards, including one from the Travel Channel for America’s Best Beaches. A number of travel publications have also dubbed this town and its beaches a must-see destination. There are two main public beaches, and both are kept pristine by town professionals. Crescent Beach, on the north side of town, offers the softest sand available, with lifeguards, clean facilities, and convenient concession stands. Turtle Beach, on the south end, offers picturesque rocky terrain and the chance to collect shark’s teeth washed in from the ocean. Either beach offers a day of relaxation and fun for everyone. Opting for any of Siesta Key vacation lodging over Bradenton hotels gives you and your family a quiet getaway from the ongoing bustle of the city. Relaxing near the water, shopping, and convenient Gulf or Sarasota Bay water access are what draws people to this land strip. Visit Bradenton as much as you would like, with a scenic drive up Route 41. Remember to reserve a day just for Siesta, however, to enjoy the scenery and your beautiful accommodations offered by Tropical Breeze. There are a number of locations in the top areas of Siesta Key, with offerings from studio rooms to single family homes. 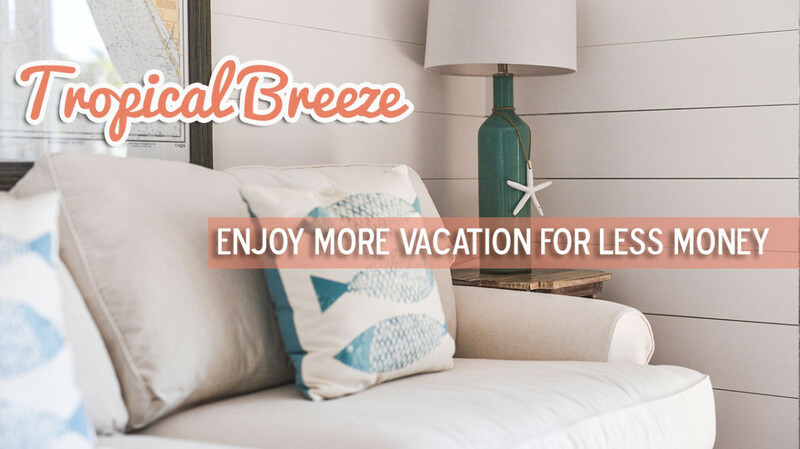 Tropical Breeze offers as much room as you need for your whole family, or smaller rooms for your personal vacation getaway.